A new play reconstructs the tension behind the famous TV interviews in 1977 with legendary British journalist David Frost and the former US President Richard Nixon. Peter Morgan's play Frost Nixon at London's Donmar Warehouse theatre contrasts its two protagonists - and asks what they had in common. By the spring of 1977 Richard Milhous Nixon had had all the time he wanted to mull over the implications of losing high office. 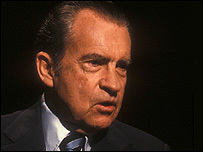 He had resigned the US presidency in August 1974 rather than face impeachment in the complex web of accusation and scandal labelled Watergate. In 1977 David Paradine Frost faced problems too. The huge success of the 1960s was behind him and his many critics were happy to diagnose a brilliant career on the wane. About the time Nixon quit the White House, Frost had lost his US chat show. Each man had things to prove. Nixon was pursued by the US networks to tape a series of tell-all interviews: the former president needed money quickly from TV and book deals to pay huge legal bills. There was general surprise when Frost won the bidding. The Washington press corps mocked: surely Tricky Dicky would make mincemeat of the one-time Brit golden boy? Peter Morgan's play dramatises the run up to taping in California and cleverly boils down what happened once the cameras turned over. Morgan has an impressive track record in turning recent history into drama. For TV he wrote the Bafta-winning The Deal (about Tony Blair and Gordon Brown) as well as the forthcoming movie The Queen (about Blair and the Queen). Michael Sheen, who played the Prime Minister in both dramas, stars as Frost in the new play. Nixon is the US actor Frank Langella - recently on screen in Goodnight, and Good Luck and as newspaper editor Perry White in Superman Returns. Sheen is playing one of the most impersonated of all TV personalities, so is it tempting to send him up? "Peter Morgan has been very careful to make sure no one gets sent up - every character is human and complex," he says. Langella agrees: "None of us is doing a caricature. The great thing is the play turns inexorably to tragedy over the course of two hours in the theatre. "You have an audience rocking with laughter and then 30 seconds later they're on the edge of their seats. It can turn dark in a moment. "Nixon had a tragic flaw - he couldn't stop the demon voices in his head which were to bring him down. Ultimately one has to feel compassion for that, though what he did was wrong and illegal." 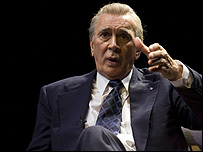 Langella thinks by 1977 Frost and Nixon had much in common: neither was short of people prepared to kick his reputation around. "They were two men born of modest circumstances who had immortal yearnings. They had a great desire to get to the top of the ladder - and stay there." 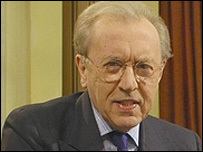 The play makes it clear that Frost and his producer John Birt - later to become the BBC's director general - were unhappy with the early interview sessions. Today the play's director Michael Grandage believes after a shaky start Frost did ultimately get to the heart of Nixon, securing something close to an apology to America for what he had done. "We take Nixon on a journey from a very low point at the beginning to a newfound strength which he finds in the interviews. He made Frost do all the work," says Grandage. "Then through Frost's brilliance at a particular moment there came a turning point. He seized it and in that moment Nixon opted for the wilderness." 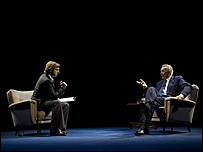 Frost Nixon is playing at the Donmar Warehouse in London until 7 October.